Finding out that you or a family member has type 1 diabetes can be a difficult time, full of doubts and uncertainty of what lies ahead. Learning about diabetes and the choices you have for its treatment can help you with the difficult decisions you face. This site aims to introduce you to one of these options: participating in a clinical research study for newly diagnosed type 1 diabetes, called the RETAIN study. Type 1 diabetes is a chronic disease that develops when the immune system mistakenly attacks its own cells in the pancreas (called beta cells). Beta cells normally produce insulin, which allows the body to use energy from food and helps control blood sugar levels. Without insulin, the body cannot function properly. At the time of diagnosis, up to 15-30% of a person’s beta cells may still be producing insulin. Preserving even this relatively small number of cells can help diabetes patients lead healthier lives. Doctors are trying to find treatments that can be used soon after diagnosis to prevent any further loss of beta cells. By the time someone shows the physical signs of diabetes, the disease has already been at work for some time. So when a person is diagnosed with type 1 diabetes, a large portion of their beta cells have already been destroyed. The beta cells that remain, however, can still produce some of the body’s much needed insulin. Researchers have found that even a small amount of insulin produced by a relatively small number of beta cells can be of great benefit to people with type 1 diabetes. It may help reduce the need for injected insulin and help maintain good control of blood glucose levels. In turn, this can help prevent secondary complications of diabetes down the road. For this reason, scientists are working hard to develop new treatments that can be given soon after diagnosis to preserve the remaining beta cells. 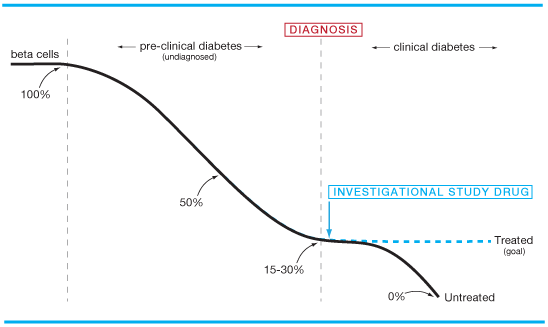 This is the goal of the RETAIN clinical trial for newly diagnosed type 1 diabetes patients.